Here's My Blog! : Happy Friday! The wonderful ladies at CSF decided that I should be the spoilee this month and, believe me, just having them think of me was spoiling and humbling enough. I am so thankful to all of them for being my friends. This lovely surprise package was sent to me by my friend Lisa. 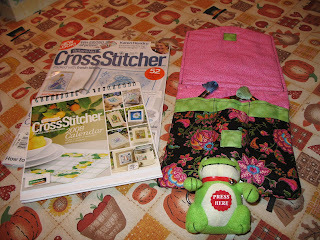 She sent me the UK CrossStitcher, which had the pretty calendar included, a bag that I am pretty sure she made herself -- which is beautiful -- and I will keep my special stuff in there. The little frog has a home on the zipper of my work project bag because I like to show up at a deposition as professional as I can and the frog can only help! Thank you so much, Lisa! You sent me so much stuff and I so appreciate it....more than I can say. Now I have an update on my Betsy! I am so much enjoying stitching this piece. I am using Vikki Clayton silks for the first time and I am finally getting the hang of them. It was really odd for a long while stitching with one thread and I'm amazed how just one thread actually does the job! I was going to wait to stitch Betsy last, but I really wanted to start her. I love it. 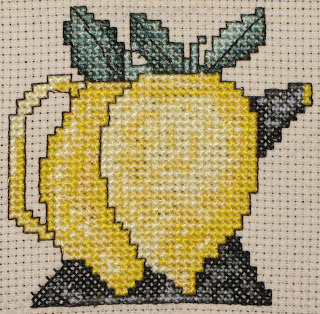 Next up is a finish I did for a RR with the Cross Stitch Obsession Yahoogroup. It's me, Sheila, Colleen, and Jane from France. I don't know why I always have to put in the "from France" when I think about or type out Jane's name, but I do! I have done a few round robins with these fine ladies and I never worry about the chance of seeing my piece again. These ladies rock! This is Sheila's piece. That's it on the stitching front actually. Now what is happening with me? Well, by now, you know that my Yankees lost. Yes, I was very sad, but the best team won. Now I'm curious to see what changes are made to my Yankees, but I want changes as I want a winning team! I am sick and tired of no World Series Ring. Sheesh. Rich started working at Gander Mountain and he really seems to enjoy it. Me? Well, he has night hours so life will be different for me. He will usually work until close so that means 10:00 or 10:30 is when he will start to come home. It's 30 minutes away so he should be home in time for Bill O'Reilly at least. Phew. I am such a whiner though...instead of being happy for him, I turn it around to me. I thought I wasn't going to do that anymore! Now, my blinkies....yes, I found blinkies. My sister Monica told me that I am ridiculous and my blinkies are annoying because they blink! Well, isn't that the point of a blinkie? She was very fresh today and I promised her that I would tell everybody about it. Don't even ask me about her complete obsession with Star Trek and INXS. Boy, oh, boy....if I had a bar of soap and if she didn't live all the way in Richmond and wasn't old enough to have a son of her own. Hmmmmmmph. My little sister Teresa and her BF Sam are coming up this weekend to visit. Actually, they have a wedding to go to tomorrow in the Poconos so they will just stay with us. She just called me and they are only leaving now at about 8:00 so they will get here at about midnight. I better put up some coffee! I am pretty sure that's all I've got right now. I'm going to go have a cup of tea and work a little bit. Rich should be getting home at about 11:00 and Teresa and Sam will be here after that. It's going to be a long night. Betsy is awesome, I so want to stitch that...her dress is gorgeous. Enjoy your time with your sister and have a good weekend! Isn't that little froggy just too cute. I have his brother Thanks to lisa. I love the pice you are working on and tell sis to sit on it about the blinkies,That's what they are suposed to do (blink) Dugh. I will be sending you a package soon as well. I know they are suppossed to blink! I've been misquoted! Blinkies are silly not only because they blink, but because they're just plain gay. So there! Seriously now, great work on your cross stitching, you're my idol and I will get back to it soon, I hope! Live Long and propser. INXS Rocks. Stitching looks great, Barb. Nice gifts from Lisa. Enjoy your new stash.